September 21, 2010 found the Cunard Line flagship QM2 anchored off Grenada in the Caribbean. It was a wonderful day to celebrate a birthday, and company founder Samuel Cunard, had he been alive would have been 223 years old on this date. 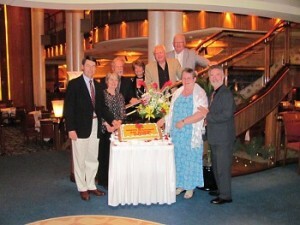 The event was recognized onboard QM2 throughout the day and in the evening with birthday cakes in the various restaurants…no presents by request! 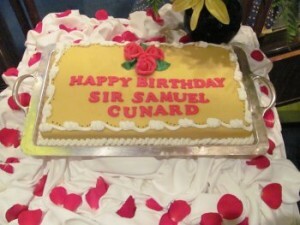 Thanks to all aboard who helped this day in celebrating the life of maritime icon Sir Samuel Cunard. Above Left: In a celebratory mood for Samuel Cunard’s birthday on September 21, 2010 was this table from Britannia Restaurant … L to R … John G. and Judith Langley, Ed Closson, Fiona and Frank McGuigan, Philip and Marilyn Carruthers and David Adams. This entry was posted in News & Activities. Bookmark the permalink.